I’m not great about breakfast. Well, I never skip it but I definitively keep things simple – toast with peanut butter and banana, or fruit bowls with nuts and granola. + Coffee. So much coffee. But both my dude and I work some weird hours and don’t like to end up buying junk on the job, so I wanted to make something we could grab to take with us to snack on. Especially for those early farmers markets mornings when I’m not trying to get up even earlier to prepare brekkie! 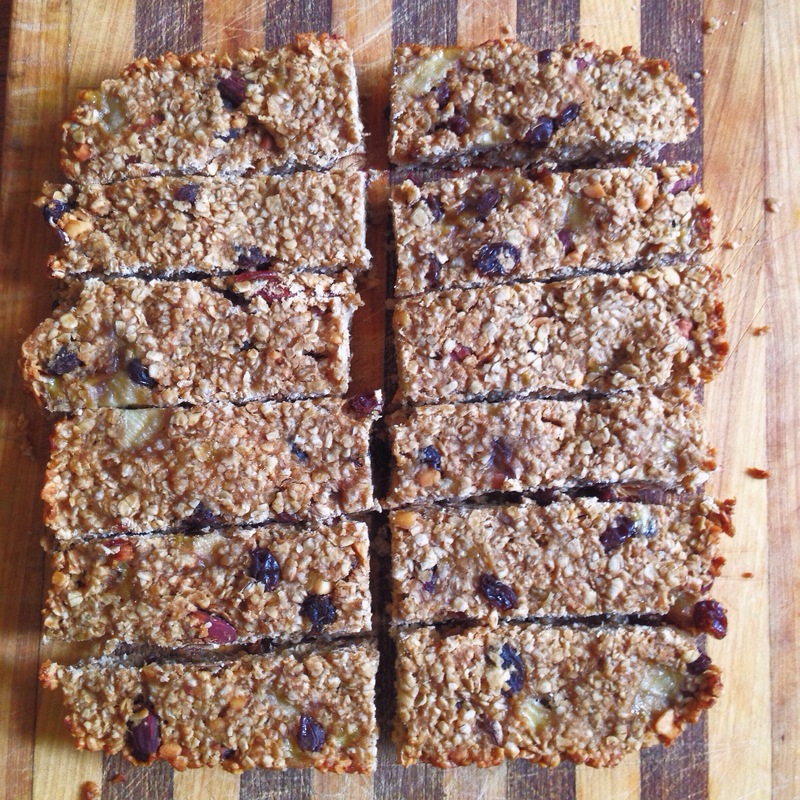 And I still had a whole bunch of oats from my Vegan Sour Cherry, Blueberry and Walnut Crumble Bars so this was the perfect time to make some granola bars. Side rant: Am I the only one who is filled with rage when buying store bought granola bars? Every time I have to pay $5 for 4 flipping bars – that are mostly oats, a super cheap food – I feel like writing a letter to the head of Kind or Nature Valley or whatever. 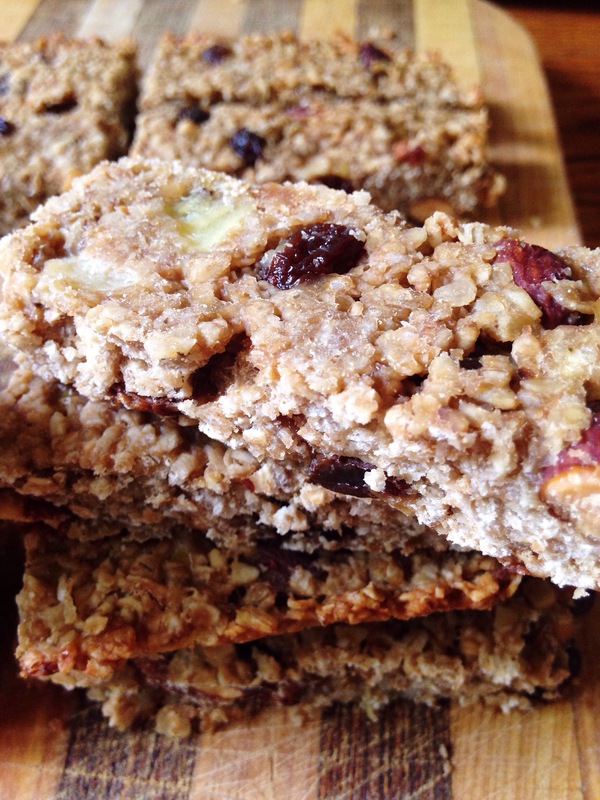 Homemade granola bars are definitely the way to go. So easy and much more value for your money, and you can put whatever you want in them! Like, more than one raisin per bar please. Ok, end rant. You can of course add whatever you want into these or use different nuts or whatever! If you want to make it over-the-top indulgent, add dark chocolate chips and/or some cinnamon, or just up the peanut butter to 1/2 cup 😉 I used the Earthbound Farms coconut peanut butter spread… Totally addicted to it. It’s like regular peanut butter’s hot cousin. I can’t go back, it’s too delicious. Anyway, enjoy! 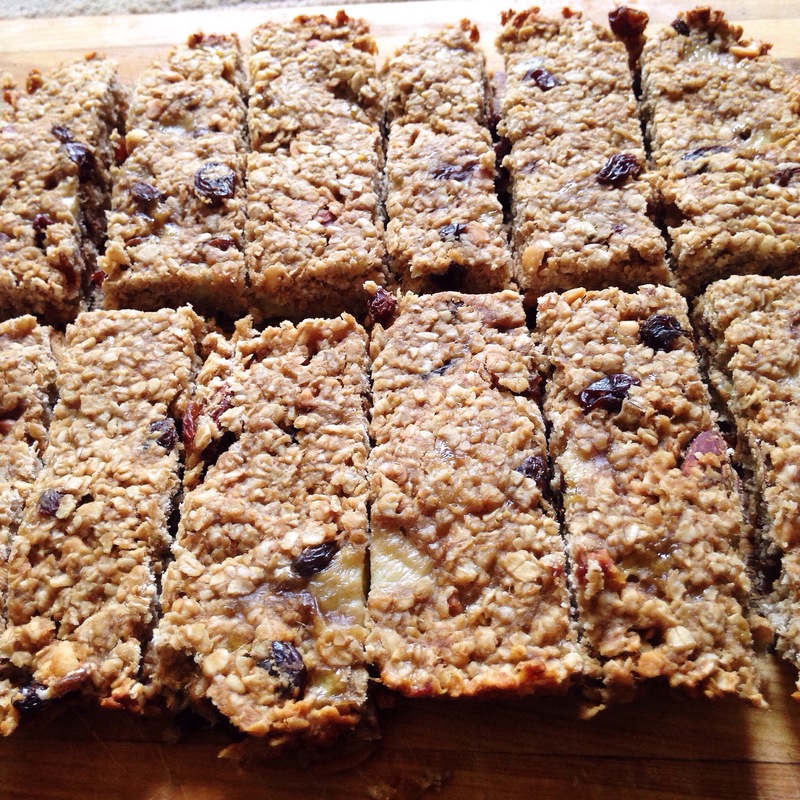 These are great for breakfast and morning snacking – not too sweet and super filling. Preheat your oven to 350. Melt the peanut butter in the microwave or on the stove and mash up the 2 ripe bananas, leaving a few bigger pieces. Combine all the ingredients in a large mixing bowl and mix it all together really well. Line a baking pan with tin foil – I used an 8×8 – and lightly grease the foil. Put the granola mix into the pan, pressing down firmly and flat, and pretty even. Take out, flip out of foil onto a board or cooling rack and let cool completely. 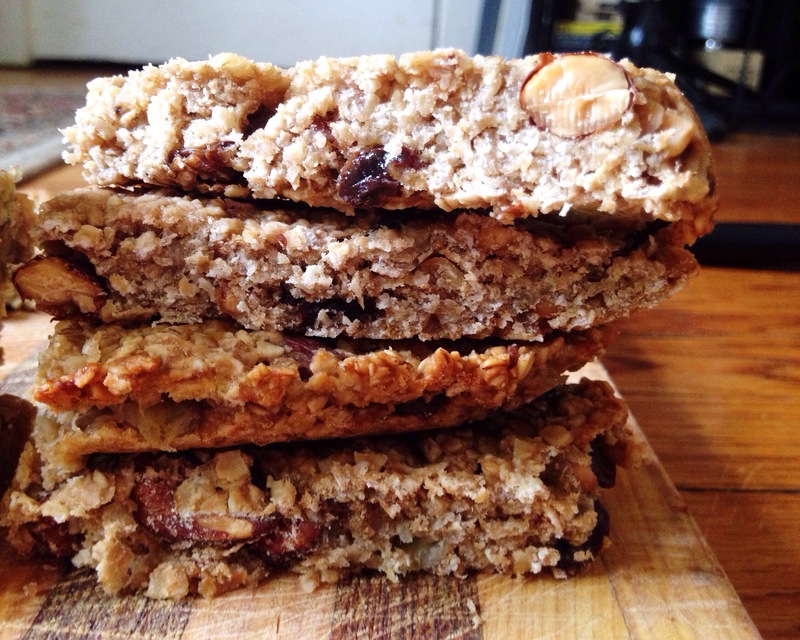 Cut into bars and take the largest one for yourself as a reward for all that hard work! I needed a good bar recipe! Thanks!